The ninth B.C. 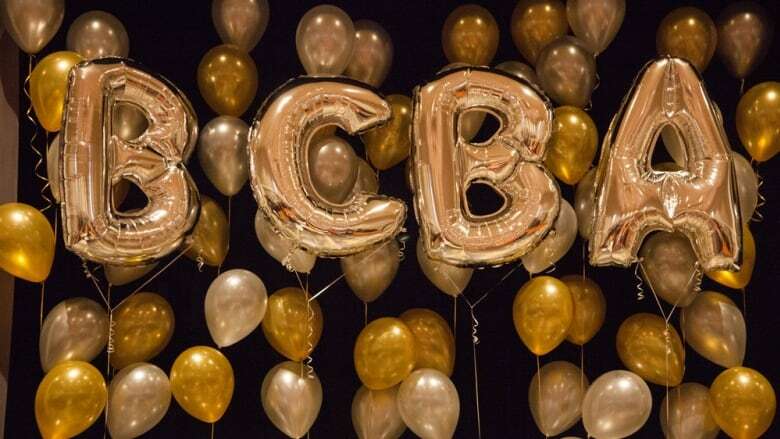 Beer Awards were held at the Croatian Cultural Centre in Vancouver on Saturday, with local favourite 33 Acres Brewing Company crowned brewery of the year at the climax of a ceremony hosted by the CBC's Lien Yeung. Judges assessed 1,050 entries from across British Columbia to determine the winners of the 2018 B.C. Beer Awards. As municipal candidates across B.C. chewed their nails awaiting the results of the civic elections Saturday, a different group of nominees gathered in Vancouver to see if their hard work had been rewarded. The ninth B.C. Beer Awards were held at the Croatian Cultural Centre, with local favourite 33 Acres Brewing Company crowned brewery of the year at the climax of a ceremony hosted by the CBC's Lien Yeung. Port Alberni's Twin City Brewing took home the other big award of the evening, winning best in show for its Late Bloomer, a tart fruit ale. A group of 54 judges assessed 1,050 entries from 109 breweries across the province for the awards. Ninety awards were handed out across 30 style categories ranging from light lager to wild ales and hazy IPA — the latter category swept by Port Moody's Twin Sails Brewing. Other significant award winners included Sooke Brewing, which won rookie of the year, and Field House Brewing of Abbotsford, which was named innovator of the year. 1. Langford Lager, Axe & Barrel Brewing Co.
2. Rye Lager, Steel & Oak Brewing Co.
2. 311 Helles Lager, Coal Harbour Brewing Co.
3. The Highway: Lager, Silver Valley Brewing Co.
1. Hüftgold, Four Winds Brewing Co.
2. German Pilsner, Sooke Brewing Co.
1. Steamworks Winter Lager, Steamworks Brewing Co.
2. Vienna Lager, Sooke Brewing Co.
3. Marzen, Steel & Oak Brewing Co.
1. 33 Acres of Nirvana, 33 Acres Brewing Co.
2. Adrift Blonde Ale, Britannia Brewing Co.
2. Humble Hive Brown Ale, East Vancouver Brewing Co.
3. Ashore Porter, Britannia Brewing Co.
2. 52 Foot Stout, Barkerville Brewing Co.
3. Barleywine, Sooke Brewing Co.
2. Steamworks Frambozen, Steamworks Brewing Co.
3. Quayside, Steel & Oak Brewing Co.
3. Sunrise Gose, Coal Harbour Brewing Co.
1. Launch Pad Belgian-Inspired Rye Ale, Whitetooth Brewing Company Ltd.
1. Hooligan, Nelson Brewing Co.
2. Outdoorsy, Steel & Oak Brewing Co.
1. Steamworks Heroica Red Ale, Steamworks Brewing Co.
3. James Brown Ale, Monkey 9 Brewing Co.
1. Truth, Dare, Consequence Nordic Imperial Stout, Whitetooth Brewing Company Ltd.
3. West Shore IPA, Axe & Barrel Brewing Co.
1. 33 Acres Of Echo, 33 Acres Brewing Co.
2. Spaghetti Western-Ish DIPA, Coal Harbour Brewing Co.
3. 33 Acres of Sunshine, 33 Acres Brewing Co.
2. Belgian Blond, Sooke Brewing Co.
3. Multi Malt, Steel & Oak Brewing Co.